If humans can act like wild animals during parties, animals can act like humans too. Even those that don’t live with us at home, those that are not domesticated at all can do the exact same hilarious things that we humans usually do. After all, we’re living on the same awesome planet. Take a look at how these 22 adorable animals make impressions of drunk humans in the most hilarious ways. Yep, that’s how you look like every time you check yourself in the mirror. And that’s how you tell your favorite bottle of whiskey all about your sadness and frustration. Remember those times when it’s half past 2 a.m. and you try to walk home drunk? 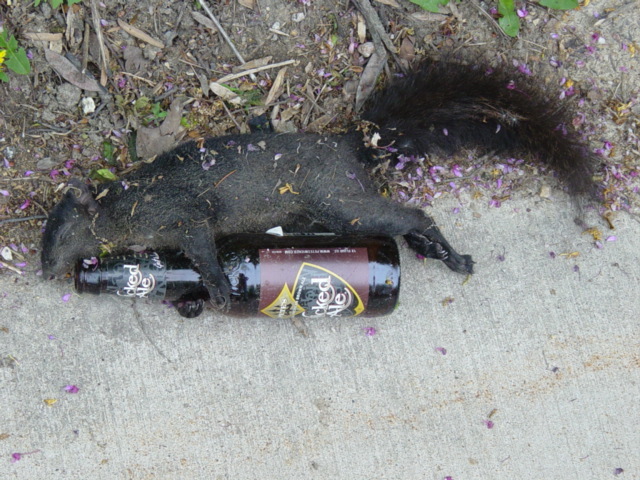 Unfortunately, this drunken squirrel didn’t make it home and just decided to stay the rest of the night (or dawn) on the street. 19. So what if I smoke and get drunk? This dog probably loves to sing that song by Snoop Dogg and Wiz Khalifa. Well, he’s the man. He’s already down, but still holds a bottle of beer and cola with a smoke in his mouth. This hard-boiled cat shows you how to be drunk like a boss. After a few shots, you won’t worry about waking up somewhere else with awful eye bags. Come on! He’s just a hard working man getting some well-deserved sleep! Oh, the genius one is drunk! He has probably mistaken the glass of beer for a glass of milk while trying to study. What an innocent little dear. This black feline right here wants to own every single bottle of rum in the kitchen. Just give him what he wants! Look at how desperate he has become. When you’re drunk, you have no idea what you’re doing. You probably don’t know anything about how you spill your guts out in the same place where you poop. Pretty disgusting, huh? This probably happens to you, too! You know, when you try to walk home, but end up on the neighbor’s lawn? Hey, cute little pup! Do you know you aren’t supposed to drink that until you’re 18? That time when you’re so drunk that you flip off on the floor. How about this? Well, maybe this happened when you were totally rejected by your ultimate crush and you just spent those sad times with a bottle of drink. You go out with a friend for some shots and go home tipsy together. Call me a hipster! I wear a cap, shades, and a watch. I’m a hippie! You are drunk, exhausted, and hungry. What do you need? Food! Yep, this is how drunken people look like when they finally satisfy their midnight cravings. You’ve probably done this as you go home drunk. You think this is the fastest way to get home and jump into bed? I don’t think so. Some drunken people look like this when drinking the first glass, while others only feel the real taste of heaven after several shots. There are three different types of people in your circle of friends. These cute little hamsters personify all three. In every party, there will always be people who need time and space to be alone. Just let them be and mind your own business until you get drunk. These type of people in parties are the classier ones. They will choose lighter alcohol drinks over hard beer, not knowing they have the same effect. As you get drunk, you may have had a conversation with a crush. This is how you looked like.